Fresh rice noodles served in our secret house beef broth recipe, topped with your choice of two meats, cilantro, green onions, and shallots. Served with a plate of fresh bean sprouts, basil, jalapenos & lime. Ground pork, glass noodles, wood ear mushrooms, carrots, taro, onions, wrapped in a flour paper and deep-fried. Served with a fish sauce vinaigrette and pickled vegetables. grilled with lemongrass and house mayo. Ground chicken with veggies wrapped in wonton paper. Seared until crispy and paired with soy sauce vinaigrette. 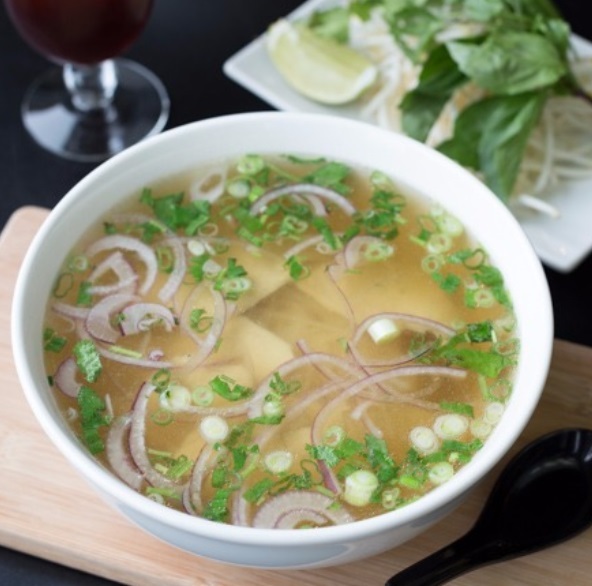 Fresh rice noodles served in our chicken broth, topped with sliced chicken breasts, cilantro, green onions, and shallots. Served with a plate of fresh bean sprouts, basil, jalapeno and lime. Ground seasoned chicken wrapped in wonton paper, steamed & served with wonton noodles in a chicken broth. Topped with BBQ pork, green onions, and cilantro, with a side of fresh herbs bean sprouts and lime. Thinkly sliced pork and shrimp with vermicelli noodles, lettuce, bean sprout & fresh herbs, wrapped in rice paper. Served with a savory peanut sauce. Fresh prawns dipped in a coconut batter and deep fried. Paired with a sweet and spicy wasabi aioli blend. Our chicken wings are fried, tossed in a blend of fish sauce and garlic for this traditional dish, served with a side of pickled vegetables. Ground chicken breast, glass noodles, wood ear mushrooms, carrots, taro, onions, wrapped in a flour paper and deep-fried. Served with a fish sauce vinaigrette and pickled vegetables. This vegetarian version of our crispy rolls has tofu, taro, glass noodles, carrots, mungbeans, deep-fried and served with our special vegetarian sauce and pickled vegetables. Chopped squid dipped in five spice, salt & pepper batter, fried with bell peppers, white onions and jalapenos. Whole prawns dipped in five spice, salt & pepper batter, fried with bell peppers, white onions and jalapenos. Chopped green & red cabbage with carrots, shallots, tossed in a lime vinaigrette, topped with some cilantro, mint & fried chili pepper flakes. Chopped romaine lettuce, spring mix, cherry tomatoes, bell peppers, mint, bean sprouts. Salmon cubes, seared with onions until well done, served on a bed of romaine lettuce, tomatoes & cucumbers. Paired with a honey soy dressing. Rib-eye steak cut into tender cubes, sauteed in a soy sauce marinade and served on a bed of romaine lettuce, cherry tomatoes, peppers, and bean sprouts. Fresh rice noodles served in 100% vegan broth, topped with tofu, vegetables, mushrooms, cilantro, green onions, and shallots. Served with a plate of fresh bean sprouts, basil, jalapeno and lime. Vietnamese banhmi are made with your choice of meats, all on a freshly toasted baguette. Served with pickled vegetables, cucumbers, cilantro & jalapeno peppers either in or on the side. Pork patties, Vietnamese pork mortadella, pate spread and house mayo. Battered catfish, deep fried and served on a baguette with Sriracha-Mayo spread. carmelized BBQ pork loin, shredded pickled vegetables, jalapenos and cilantro served on a toasted baguette with house mayo. 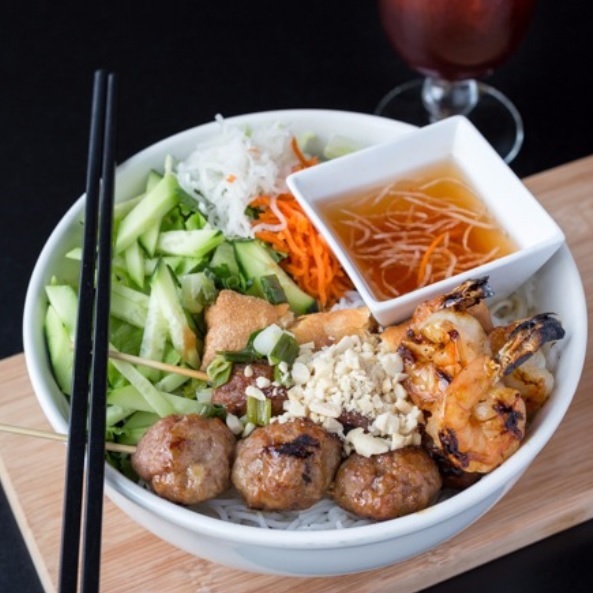 Vietnamese rice vermicelli noodles, with your choice of grilled marinated selection, topped with mixed greens, cracked peanuts, fresh basil and green onions. Served with a side of our fish sauce vinaigrette or vegetarian vinaigrette and pickled vegetables. Lemongrass marinated grilled pork meatball skewers, beef, chicken, or pork, comes with an eggroll & shrimp. Beef short ribs marinated in a soy sauce mixture with onions, roasted sesame seeds, asian pear & garlic. Grilled pork cutlets marinated with lemongrass & garlic. Tiger prawns with caramelized shallots & garlic. Grilled tenderloin beef, marinated with lemongrass, roasted sesame seeds & garlic. Grilled chicken marinated with lemongrass & garlic. A mix of egg and rice noodles with shrimp, BBQ pork, Vietnamese pork sausage, and quail eggs in a chicken broth, topped with green onions, cilantro, fried shallots, and garlic. Served with a side of fresh basil, bean sprouts and lime. Tender beef brisket slow cooked in a savory five-spice beef broth with carrots, topped with shallots, green onions and cilantro. Served with a side of bean sprouts, thai basil, and lime. Choice of rice noodles, egg noodles or a fresh baguette. Rice udon noodle with crab legs, shrimp in a chicken broth, topped with green onions, cilantro, fried shallots and garlic. Served with a side of fresh basil, bean sprouts and lime. Seasoned chicken slow cooked with onions, carrots, potatoes and bay leaves in a coconut lemongrass curry spiced broth, topped with green onions and cilantro. With a choice of rice noodle, or fresh baguette, served with a side of bean sprouts, basil and lime. Thick rice vermicelli with tender slices of beef shank and Vietnamese pork sausage served in a spicy lemongrass beef broth, topped with green onions, shallots and cilantro. Served with a side of fresh basil, bean sprouts and lime. A mix of egg and rice noodles with shrimp, BBQ pork, Vietnamese pork sausage, and quail eggs with our secret house soy based sauce, topped with green onions, cilantro, fried shallots, and garlic. Served with a side of fresh basil, bean sprouts and lime. Sizzling BBQ short ribs marinated in a soy sauce mixture, sesame seeds, served with rice, a fried egg, lettuce, cucumbers, tomatoes, topped with green onions in oil, served with our fish sauce vinaigrette and pickled vegetables. Chicken thigh deboned and cut, served with white rice cooked with our chicken-ginger broth. Paired with cucumbers, tomatoes and our secret house soy sauce. Chicken marinated in a lemongrass seasoning, wok grilled, served with rice, lettuce, cucumbers, tomatoes and pickled vegetables. Spicy chicken wok tossed in a dark soy marinade with red bell pepper, green bell pepper, celery, garlic, green onions, water chestnuts and roasted cashews. Served with rice. Pork chops marinated in an oyster sauce recipe, with shallots and garlic, served with rice, lettuce, cucumbers, tomatoes and pickled vegetables. Rib-eye steak cut into tender cubes sauteed in a soy sauce marinade with red onions, served with tomato rice, lettuce, cucumbers and tomatoes. Paired with a side of pickled vegetables and salt, pepper lime sauce. Sliced flank steak stir-fried with vegetables in a savory soy sauce marinade, topped with green onions and chili peppers. Tender flat iron steak sauteed with onions, garlic and broccoli in our stir fry sauce. Salmon steak cubes caramelized in an onion, ginger, garlic sauce with roasted sesame seeds. Served with rice, lettuce, cucumbers and tomatoes. Paired with a side of salt & pepper lime sauce. Catfish filets sauteed with garlic and shallots, then braised with a thick soy sauce mixture in a clay pot, topped with green onions and a red chili. Vietnamese wok fried with broccoli, cauliflower, carrots, celery, snow peas, white onions, dried hot chilies and garlic. Tiger prawns sauteed in a fish sauce garlic blend, white onions, green onions and red bell pepper. 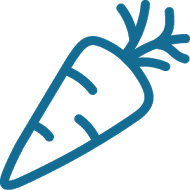 Fresh carrots, broccoli, cauliflower, celery and mushrooms sauteed in a rich creamy coconut cream curry. Curry fried rice with pineapple, eggs, onions, garlic, fresh ginger, chilies, red bell pepper, and cashews. Fried rice with shrimp, tobiko flying fish roe, shallots, garlic and topped with chopped green onions. Fried rice with crab wok fried with eggs, ginger, garlic, shaoxing wine sauce, topped with fresh green onions and cilantro. Lemongrass stir-fried with broccoli, cauliflower, carrots, celery, snow peas, white onions, dried hot chilies and garlic. Rice stick noodles, stir-fried in a fire wok with a tamarind paste, eggs, onions, served with bean sprouts, green onions, cracked peanuts, chili flakes and fresh lime. Wide noodles stir-fried with cauliflower, broccoli, carrots, mushrooms and celery. Glass noodles stir-fried with broccoli, cauliflower, celery, carrots and mushrooms. Rice stick noodles, stir-fried in a fire wok with broccoli, cauliflower, carrots, celery & cabbage. Wide noodles stir-fried with our chili paste, basil, eggs, served on a bed of chopped iceberg lettuce. Sweet potato glass noodles stir-fried with onion, cabbage, broccoli, cauliflower, celery & carrots. Pollock fish, squid, scallops, and green mussels stir fried with onions, celery, carrots, cauliflower, broccoli, and mushrooms. Served with a side of white rice. Choice of any of our pho in a kid's size. Rice or noodles in a kid’s size.